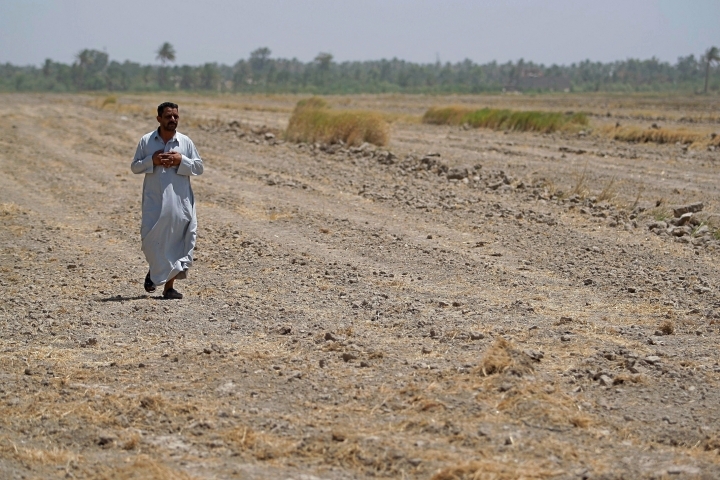 MISHKHAB, Iraq — Iraq has banned its farmers from planting summer crops this year as the country grapples with a crippling water shortage that shows few signs of abating. 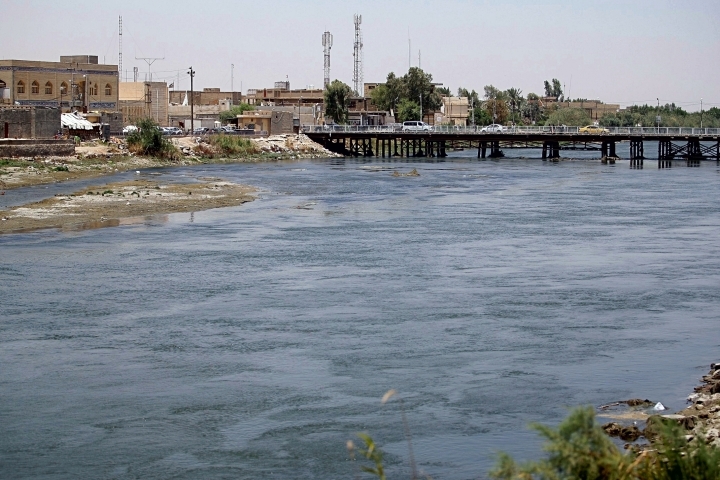 The volume of water flowing in these two vital rivers — which together give Iraq its ancient name, Mesopotamia, the land between the rivers — fell by over 60 percent in two decades, according to a 2012 report by the U.N.'s Food and Agriculture Organization. 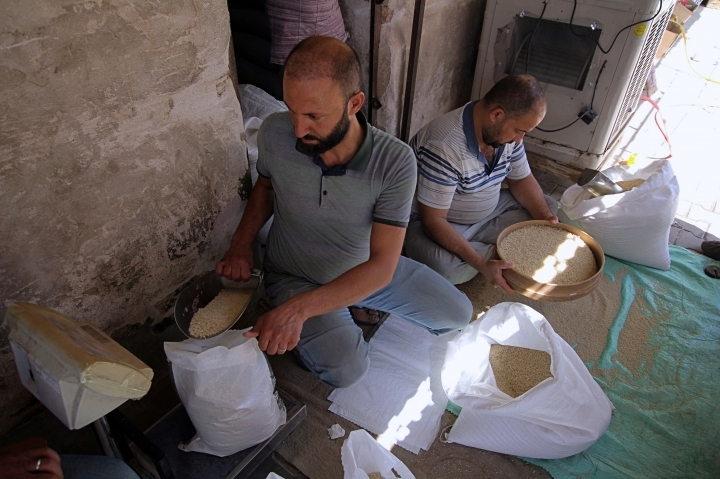 "What's happened this year is a combination of low rainfall, low ground water, and the new dam that Turkey has built," said Paul Schlunke, a senior emergency response coordinator for the FAO in Erbil. "It means there's no water for the south (Iraq)." "I feel as though my very existence has been shaken," said farmer Akeel Kamil as he surveyed his barren fields near the town of Mishkhab. His 100 dunams — about 25 acres — last year produced 150 tons of Anbar rice, a strain particular to Iraq that is prized for its gentle, floral aroma. This year, the pumps that would be flooding his fields with water are silent, and the irrigation canal that runs by his property is nearly empty. Flood irrigation has been used in the area for millennia, though FAO has warned of massive water wastage. 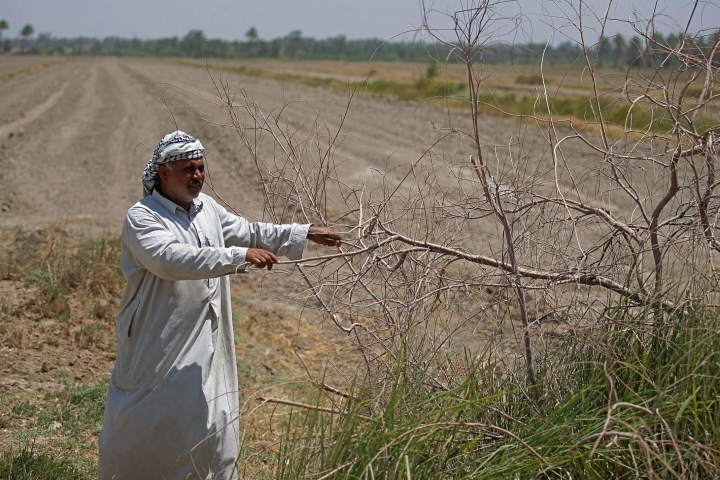 It and other organizations are calling on the Iraqi government to revamp its approach to agriculture and promote more efficient methods including drip and spray irrigation. Iraq's Natural Resources Ministry protests it does not have the budget to do that. They demand the government secure more water from Turkey, fill the country's reservoirs, and drill into the nation's aquifers. "When we protested, no one listened to us. Then we closed the levee, and the police came and the politicians started calling us vandals. Is this how a government behaves with its people?" said Mahdi al-Mhasen, a 48-year-old farmhand in Mishkhab. The rumblings here will be heard in Baghdad. South Iraq is the popular base of the Shiite blocs that have led Iraqi governments since Saddam Hussein was deposed in 2003. The rice belt hugs Najaf, Shiite Islam's holiest city, where theologians and politicians have powerful influence. Grand Ayatollah Ali al-Sistani, the highest Shiite authority in Iraq, castigated lawmakers, telling the government it must help farmers and modernize irrigation and agriculture. 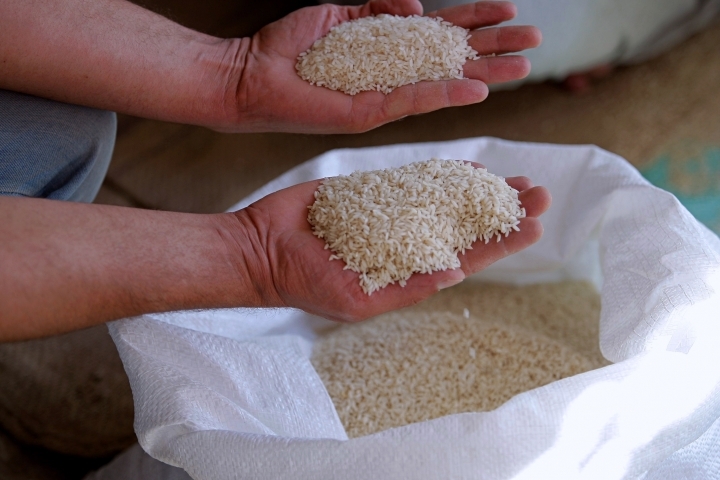 In response to the pressure, the government said it reversed its ban on rice farming. But Agriculture Ministry spokesman Hameed al-Naief told the AP that only 5,000 dunams (1,236 acres) of irrigated land could be allocated to the crop this summer, less than 3 percent of the area permitted last year. The impact of waning water resources is clear around Mishkhab. Local divers and river patrols say their branch of the Euphrates is far shallower than it was this time last year. Green scum collects under bridges where the water has stagnated and fishing boats are stranded on the river bed. Earlier this summer, video on social media showed the water levels of the Tigris River so low that Iraqis in Baghdad were crossing it on foot. 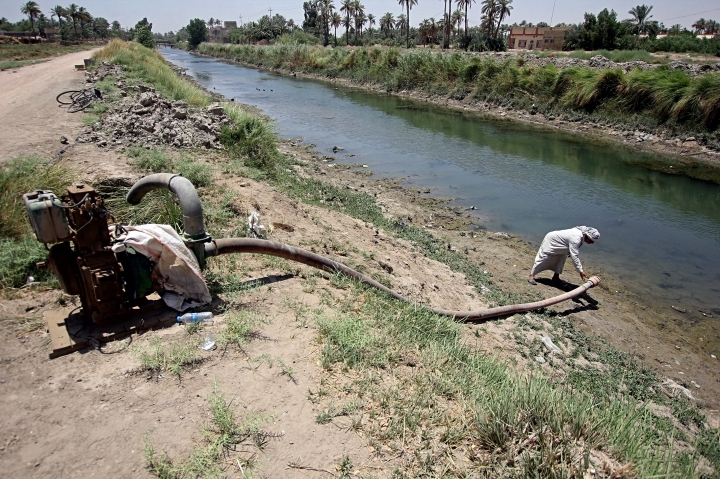 About 70 percent of Iraq's water supplies flow in from upstream countries. Turkey is siphoning off an ever-growing share of the Tigris and Euphrates to feed its growing population in a warming climate. And it is building new dams that will further squeeze water availability in Iraq. Turkey started filling its giant Ilisu Dam upstream in June, then paused the operation until July after pleas from Baghdad. 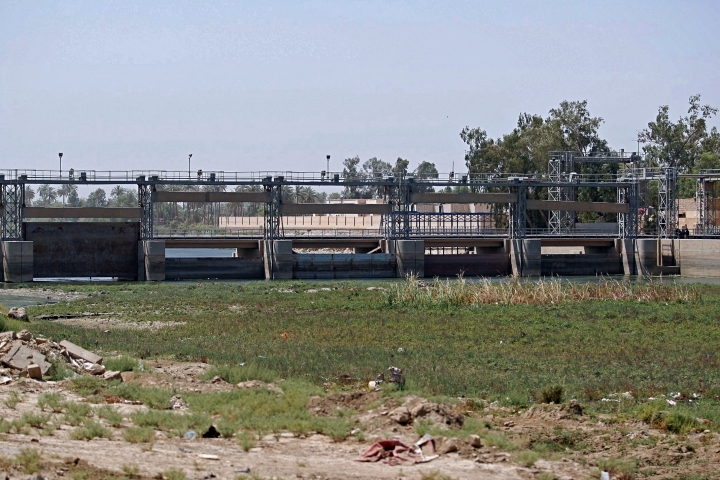 Iraq's Water Resources Ministry says it has enough water behind the Mosul Dam to guarantee adequate flow for a year, but experts say the Ilisu could take up to three years to fill, depending on rains. The last moratorium on farming rice came in 2009, but that year farmers were permitted to grow other crops to shore up their income. This year, there is no such reprieve. Though it is OPEC's third largest oil producer, Iraq, unlike Saudi Arabia, does not distribute revenues to the general population. Farmers in Mishkhab say they have little to fall back on with the loss of the summer season's income. Families that depend on credit to cover their expenses during the growing season are afraid their lenders — shop owners, mechanics, even friends — won't lend to them this year because they know the rice harvest has been cancelled. "What will happen to our lands?" asked Kamil, the 42-year-old farmer. "Should we leave them? Should we move to the cities?"